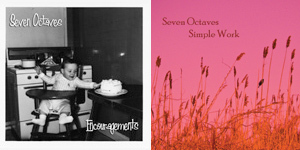 Seven Octaves: April Two-fer Sale!! Get both full-length Seven Octaves cds (including the newest release "Encouragements" ) for only $12 with free shipping (outside North America add $4). 24 of my finest tracks plus all the cool artwork shipped the next business day. In addition - you'll also get a free download of the upcoming single "I Know It's Coming" when it is released early this summer. So it's a treat that'll satisfy now and perk you up later! Click the album covers above to take advantage of this deal. In other happy news - "The Real Me" got this sweet review (in French), and the album "Encouragements" also got props from Chain D.L.K. Last week the cd re-entered on the rpm top 10 charts at both CFBX and CKXU. (Thank you! ♥). Now it's time for some US charting! Work continues on finishing up 2 new tracks including the single mentioned above; as well as a new project - "I'm Cold. Me Too." an e.p. with music inspired by the chilliest inhabited cities in the arctic. Brrrrrr! 1st track is drum and bass titled "Barrow".